Markets In Critical Transformation, Chaotic Behaviour Has Just Began. Our inability as market participants to properly frame market fragility and the inherent vulnerability of the financial system makes a market crash more likely, as it helps Systemic Risk go unattended and build further up. For the first time in a while, elusive economic narratives started to fail at blaming market weakness on secondary-order factors: Trade Wars, the FED, Oil prices. Attempts at dismissing market events as no more than a temporary turbulence miss the bigger picture and cast the fishing net on unaware investors looking for a dip to buy. In contrast, over the last month, conventional market and economic indicators (e.g. breaks of multi-year equity & home price trend-lines, freezing credit markets, softening global PMIs/orders) have all but confirmed what non-traditional measures of system-level fragility signalled all along: that a market crash is incubating, and the cliff is near. Nothing has happened yet. After a slow start, the season of market chaos has taken off. In the last few months, global markets have visibly entered the ‘phase transition zone’, a process of critical transformation that will eventually lead to a new equilibrium at significantly different levels, after severe ruptures and a possible full-cycle market crash. 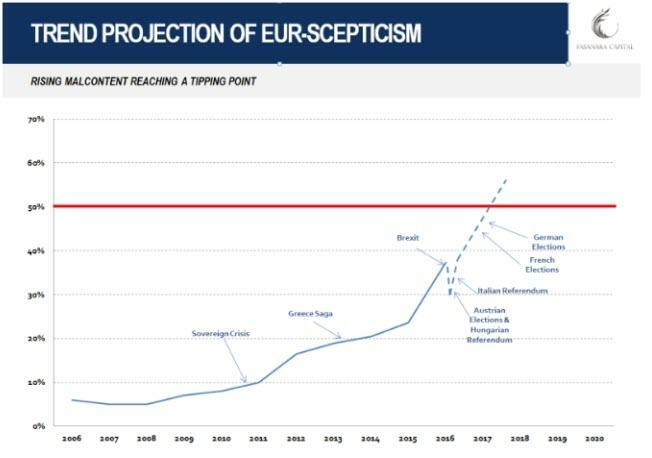 At a time when it was far less obvious, the unstable equilibrium of the market state was indicated a year ago by the ‘early warning signals’ ('EWS') provided for by the application of Complexity Science to financial markets. Distinctly, the general properties for complex systems in transition, after reaching the Tipping Points which compromise further expansion, were showing up, one after another: ‘conditional slowing down’, ‘flickering’, ‘auto-correlation’, pockets of stress, absence of traditional market buffers and consequent loss of system resilience, entropy/Ricci curvature in measurement of a low-diversity market structure. This was the basis for the tipping point analysis we proposed in Jan 18 ‘Fragile Markets On The Edge Of Chaos’ (link) and presented in the ‘Tipping Points & Crash Hallmarks’ investor deck (slide 30 at this link). Looking at markets as organisms at the systemic level, hence complex and dynamic inter-webs of connections that adapt to local conditions as emerging properties arise, helps predict shifts in regimes better than over-analysing each of its constituent parts in isolation. In the past two months, the more traditional indicators of conventional market analysis have confirmed what complexity indicators ('EWS') had indicated all along: (i) multi-year breakdowns in trend-lines for major equities, bond and real estate markets; (ii) sharp tightening in financial conditions and inverted US rate curves; (iii) sudden gaps in equity multiples, typical during recessions; (iv) high yield bonds and leveraged loans breaking down, together with frozen capital markets; (v) weakening economic activity indicators from China to Europe to now the US; (vi) together with Apple and Samsung opening the season of supposedly-shocking profit warnings with fanfare. We made our case in a recent interview with CNBC, available at this link. In November, market weakness was blamed on a suddenly imploding oil price, after a 2-year period of stability and relentless ascent. The trigger for peace in markets was then expected to be an OPEC agreement on the 7th of December. The OPEC agreement materialized, on the high end of expectations, and yet markets continued their turmoil, without much else as apparent explanation. Market woes were then blamed on the trade wars between China and Trump. The contenders exchanged warm smiles and reached a promising 3-month truce during the G20 meeting in Argentina on the 30th of November. Yet, crumbling markets could not catch a break. This was all the more disconcerting as markets melted during traditionally strong seasons: Thanksgiving, Black Friday and December. Highlighting the problem of investing with probabilities on your side, during abnormal market conditions and critical transitions. Elsewhere, market softness was attributed to rising interest rates, as yield on US 10-year Treasuries peaked in early November. However, rates fell roughly 70 basis points since, and markets kept tumbling. To most, the favourite suspect for weakness is the end of QE and the tightening of global liquidity. While this is relevant and plays a key part, it is only a piece of the puzzle. Our Tipping Point Analysis (‘TPA‘) tried to put other key elements in perspective. Expectations to see market weakness fading should a major Central Bank decide to get back behind the wheel, through another round of liquidity (China it is often rumoured/hoped, or a FED QE4 or the ECB) would likely fail, this time around, after any respite rally, however strong, upon announcement. A greater disease is at play, which has been papered over and ignored for far too long, leading markets into over-concentration, low diversity and over-extension into bubble territory. Another easy scapegoat is the FED policy and Jeremy Powell resilience in the face of political pressure. Again, we doubt it. A non-hike last December would have only confirmed the legitimacy of market panic, and likely lead to no different end results. The idea that markets got disappointed by a ‘FED on autopilot’ instead of a ‘data-driven FED’ is relevant but too easy a common rationalisation, no more than other fickle ex-post narratives at play. Markets are no longer in the FED’s hands, either way. The spell is broken. In the short-term, a rebound in stock prices is likely, based on statistics for previous cases of heavily oversold market conditions. Fund flows for retail investors (selling) and ‘institutional investors’ (buying) also seem to indicate that a temporary turn of fortunes for troubled markets is likely, as recently indicated by JPMorgan. However, again, it is unsafe to apply statistics on non-normal market conditions. What is true 'most often than not' is a vicious trap during phases of regime change. Every crash will necessarily go through a failed buy-the-dip, by definition. Picking up dimes in front of a steamroller, just because statistically it worked out fine, may be ill-fated during end-of-cycle market shifts. In systems theory parlance, far-from equilibrium dynamics applying to systems crossing critical thresholds, which then transition across their basin of attraction, after a long period of system degradation and over-extension due to self-amplifying positive feedback loops. A system in transition, after hitting capacity constraints in synchronicity, tends to behave chaotically. Dislocations and price anomalies become the new normal, until the transition to a new attractor is completed, and a new equilibrium emerges. It now then gets complicated for a number of mainstream investment strategies who are predictably not designed to recognise market conditions as abnormal. By construction, traditional investment strategies are ill-equipped to deal with markets in transformation, be it active, passive or in between. Long volatility funds emerged as winners in February, when the market’s engine first clogged and gave hints of trouble ahead. However, they worked not as well during Q4, as the turmoil intensified, due to implied volatility and the VIX index not moving proportionally to the market decline. The VIX is affected by structural flows that systematically sell volatility, thus jeopardising its role of both a measure of risk and a crash hedge, when used in isolation. Chances are that its underwhelming performance will happen again, and possibly even during a dramatic flash crash. Other common hedging tools have also failed, which signify more dislocation for a broken market: Gold, the Swiss Franc and the Japanese Yen (until its own flash crash few days ago). World-renowned long-short investors, like David Einhorn and Dan Loeb, had a difficult time in 2018. The inability of seasoned and skilled investors to cut it in the current markets is itself a sign of anomaly and un-traditional market behaviour. It would be easy to categorise it as poor judgement in a bad year. The insensitivity to fundamentals of passive and quant investors, and their rising share of total flows, also only partially explain it. We rather see it as a confirmation signal for a deeper malaise, the broader theory of transformational markets acting weirdly while in critical transition, ready to snap and let go of potential energy. Their untypically large underperformance is part of the long list of price anomalies which we kept updating ever since mid-2017, as they emerged with increasing frequency. Quant and systematic funds are in no easy landscape, now that markets have entered chaotic territory. The definition for quant funds is necessarily loose. With big differences, it includes ruled-based strategies with various degrees of rigidity in auto-piloting. We refer to them loosely as ‘quasi-passive’ strategies. From market making programs and high frequency trading shops, to risk budgeting / risk parity funds, to CTA trend-following and range trading vehicles, to some of the low volatility and short volatility strategies, to behavioural risk premia funds, down to the bottom end of fully-passive index trackers. The basic problem common to them all is the time series their models were trained upon, their machines learned from, over the past decade, which was itself a rigged time series: a decade-long un-volatile trend-up in equity & bond prices and trend-down in volatility, under the protracted push of QE/NIRP, and their reflexive loops with the private investors' community (slide 20 and 21 here). What is the quality of a strategy when the data that such strategy is derived upon is poor in quality itself? A question worth asking then, is how did the quant/algo funds make sure not to learn the bad habits in a manipulated data series? Their recent bad performance, in line with markets, does not help the cause. CTA funds will find it hard to provide the 'crisis alpha' they are trusted upon for. We discussed it in a recent chat with other market practitioners during the Naked Short Club (link). Rapid inversions of the price action, constantly putting them on the back foot, asymmetry/skewness of moves, before potential gap downs and flash crashes. The shape and tempo of price dynamics will likely not be kind; a market looking to clear pain levels, as is typical of illiquid August markets. Needless to say, these are generic considerations for the broad categories of investment strategies and exceptions apply. If anything, it will be the ideal market environment to prove one’s worth as a strategy and capacity for true alpha. In frail and now broken markets, rich in anomalies and acting oddly while in transition, the one historical analogue to fear is not so much 1987, where automated trading exacerbated a market downfall, but rather the Quant Quake in August 2007: at that time, renowned quant funds, including the famed Goldman Sachs QIS fund, lost 30% in short order, without any apparent reason. Perhaps, as is proposed, it was due to over-crowding across similar positions and across funds of a different nature, and a fast liquidation breaking-out somehow somewhere that spread across as a pandemic. Still, to date, nobody knows with certainty what the trigger was. A decade has gone by, and the jury is still out, which speaks volumes of market brittleness. That fast crisis moment could play again in rehearsal soon, except with a 10-fold impact, and more durably than for a few days only, given that the basic ingredients of over-crowding and over-correlation have now percolated across investment strategies of most types. For those interested, we analysed market behaviour for different clusters of investors in several previous notes (amongst which, here and here). The tree of 'positive feedback loops' below, attempts at putting them together in a single place, reverse engineering how their systemically-relevant high correlation built up over time. Inevitably incomplete but it gives the idea of where it all emanated from. Here below we draw a tentative timeline for key events in what is likely to be an action-packed new year. on-exhaustive list, just a few obvious suspects. Given our overall view for market system instability, it becomes crucial to monitor upcoming catalyst events, as any of them may be able to accelerate the large adjustment we anticipate. 1. Inflammable Market Structure. The list of catalysts starts with a non-catalyst. No trigger needed. The market structure itself remains top of the pile of concerns to us. A prolonged period of QE/NIRP and manipulation of price discovery for risk assets has morphed the structure and micro-structure of the market itself, heavily affected correlation across investment strategies, created over-concentration on a few juggernaut asset managers, motivated a shift into passive and quasi-passive investment biases, increased retail’s access to markets and made their fickle behaviour ever more relevant. These self-reinforcing loops make for an inflammable market environment, which may implode on its own devices, under its own weight, at some tipping point in close proximity. 2. Trump Factor. The Mueller investigation will come to a conclusion in the next few months, with revelations likely to damage the Trump Presidency, in full or in part, especially now that Democrats control the House. To an extreme, the case may affect the longevity of the Trump presidency, at which point the chances to see him going down quietly without a fight are slim. When boxed in a corner, the President may be compelled to engage in tactics to redirect attention away from domestic issues. This includes geopolitical confrontations with China or Russia, or any other less obvious frontline. Given that the Equity Bubble postponed its deflation thanks to tax cuts from an assertive Trump administration in full-control, any change to that working assumption has immediate and violent ramifications for asset prices. 3. China’s GDP and Trade War US-China. Growth numbers out of China will be high on the watchlist this year, as they may accelerate global softness in economic indicators. In this respect, trade wars with the US may find a respite in the short term, after a deal may be engineered where both sides give concessions in a politically face-saving manner. However, the confrontation with China is real and destined to last for a long time. It is not the fleeting caprice of President Trump: it resonates far-and-wide across American society, from AI to cyber security, to copyright infringement, to political and military influence globally. The size of China, a 13trn economy, is such that globalisation can no longer simply grow the pie bigger for all; rather it becomes a race for a bigger slice of the stalling pie. The reach for global hegemony is on and pressing, at a time when China’s ascent is self-evident and overtaking the US economy in size within the next decade, at current rates. Time is up to do something to tame it, in line with the well-known Thucydides trap’s dynamics. Thus, we expect trade tensions to escalate in the years ahead and affect China’s growth rates. Such growth rates affect global GDP, as they contributed a big chunk of its growth in recent years, which in retrospect affect global risk assets. Additionally, China growth rates may have a dramatic impact on an economy over-burdened with debt and running fast towards a ‘Minsky point’ - the moment of debt saturation where income does not even cover interest rates expenses, let alone capital, and where a deceleration in credit expansion is all it takes to set the tall pile of debt on fire. In the short term, clearly, the first moment to watch is the agreement which is being discussed and should be revealed soon. At the end of February, the truce on tariffs agreed between China and the US expires, and tariffs will increase on another $200bn worth of imported goods from China. The other moments to watch are the releases of China's GDP growth numbers. Analysts 'fear' a slowdown to 6.2% (from 6.7%). To us, it seems an awfully high number, anyways, and one which is easy to use for shock value. The base is set so high that the potential for a surprise effect looms large on what have now become less-complacent, moody markets. 4. Trade War US-Europe. The calendar of key events includes the ruling of the US Commerce Department, expected for February, which may slap tariffs on automobile imports if considered to be a national security threat. Such designation would avoid a technical breach to WTO rules. German car manufacturers would be more directly impacted, but ramifications go beyond that, to include a fully-fledged trade war with Europe, and a final blow to the relevance of international committees such as G-20 or WTO. Incidentally, the WTO will run out of the minimum three judges quorum by December, should the US keep blocking appointments, which would eliminate a key dispute resolution mechanism for global trade disputes. 5. European Parliament Elections. The dissolution of the European Monetary Union, and its EUR-peg across member states, is far from inevitable. Yet, as we argued in recent years, it stubbornly keeps on standing right alongside a well-defined trend-line, when extrapolating the linear trend of political and economic events from the last decade. Populism grew year after year within the Union, and far broader than that, with each new year we can say that it is larger than the year before, and reaching power in more countries than it did in the year before. The direction of travel is unmistakable. Again, a de-construction of the EUR-peg is far from unavoidable, but no new year in the last five has helped avert it. In recent times, we added to the list: a wholly populist government in Italy; diminished Macron and Merkel presidencies; more political rioting in Central and Eastern Europe; and a more assertive and non-integrationist Nordics’ bloc led by Holland (the 'New Hanseatic League' link). In and by itself, the Union remains an unfinished project, inherently unstable and structurally unsustainable. As wih all things unsustainable, it will eventually stop if one is to judge by 'Stein's Law'. The best chance of recent times stood with President Macrn, as he envisioned the only alternative path forward for the Union that was proposed, and an idea for restructuring it so to address its most severe flaws and make it more sustainable. His voice remained isolated, falling on the deaf ears of Chancellor Merkel, despite it being offered at a propitious time of relative momentum in the EU economy and early in Macron’s presidency, where political capital is more easily spent. Two years later, the idea seems dead in its tracks. President Macron is past his prime, facing urging domestic issues and a nose-diving popularity. Chancellor Merkel is on her final legs and no longer able to help form a strategic vision (assuming she ever wanted true integration). While the opportunity was wasted, Italy got clearly and durably out-of-line with the EU status-quo regime, now leading a resurgent movement of anti-EU sentiment across the continent. Restructuring the EUR-peg, may be seen, at some point down the road, as the lesser evil to take to preserve the EU construct, which we all desire. In this light, European Elections in May will be a key event to watch, well and beyond Brexit. We view Brexit as an overly-hyped topic: unlikely to create havoc even in the case of a Hard Brexit. In our opinion, the hard non-consensual Brexit remains itself an unlikely scenario. The real vulnerability lies with the Union. Brexit is only a dot in a long-standing trend-line of events which have progressively vandalized the Union 's weak foundations. In the long term, European elections may be far more damaging than any shape or form of Brexit in determining the future direction of the EU, its long-term vision (if any), and therefore its ultimate fate. 6. Inverted US Yield Curve. The Fed will not cut deposit rates anytime soon, while long-term rates can fall further on equity weakness. The US curve is already inverted in the 2-5yr segment and it is only 15 basis points far from inversion in the 2-10yr part. Inverted curves have historically been correlated to upcoming economic recessions, to which they proved to be remarkably consistent predictors - although the debate runs vibrant when it comes to define causation links. A recent study (link) of the St Louis FED analyses why an inverted yield curve might itself cause a recession, in addition to predict one. Firstly, through the banking channel, as banks are likely to cut back on lending when they cannot lend higher than they borrow at, which in turn puts brakes on economic activity. Secondly, banks showed a tendency to tighten lending standards in the presence of inverted curves, given the more uncertain economic outlook and subsequently lower risk tolerance. Thus, an inverted yield curve might do more than predict a recession: it might actually cause one. We may want to add to the list another factor: in the recent cases of curve inversion (1980, 1990, 2000, 2006) the curve was inverted but at much higher overall levels of rates, signalling broader manoeuvring space for monetary policymakers. This time around, inversion happens at closer to the zero bound than before. Inverted curves and the lower leverage available to policymakers to manage those curves may convince banks that the information content of such curves is even more significant, curtailing lending further. When cash returns more than long-term investments, be it bond coupons, equity yields or capital investments such as plants and machineries, the incentive is high to stay in cash. The dynamic slows down spending and investing, further curtailing economic growth. 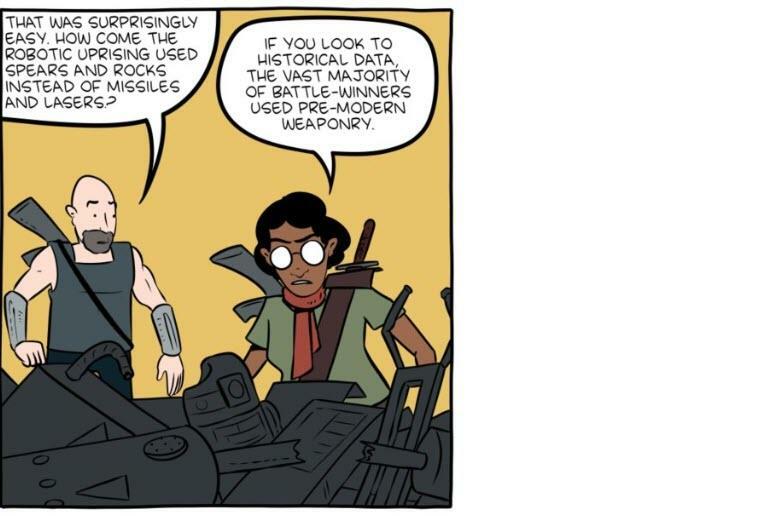 Less lending, less spending. This will therefore be an interesting dynamic to watch over the course of 2019, at a time when the risk of a US recession is top of the list of concerns in investors' mind. 7. Ukraine & Turkey Elections. 2019 will see a few key election rounds (in addition to European elections): Ukraine and Turkey (local) in March; Indonesia, Afghanistan and India in April; South Africa in May (likely); and Argentina in October. Ukraine and Turkey are particularly relevant. In Ukraine, military confrontations with Russia have quietly resumed ever since last November and are unlikely to fade until the next presidential elections at the end of Q1. Given the time overlap with the Muller investigation coming to a head in the US and approaching European elections, any flare up in hostilities is likely to be met with a prompt response, and therefore carries a double weight. Coincidentally, at the end of February, the ultimatum of President Trump on Russia on the Intermediate-Range Nuclear Forces Treaty will also expire, triggering a 6-month notice to end its commitment to the 1987 treaty. A potentially relevant mix of events, making bloated headlines in thin-skin markets. 8. Oil Price. It could be a wild card in 2019. Trump wants it low, to help US consumers and provide the equivalent to a 'tax cut' (his emphasis). Exponential technological innovation makes it super-low (and obsolete) in the long-run, which should always be thought of as a long-term attractor, an inescapable ultimate destination, at below $20 a barrel. End of QE deprives commodities of its strongest bidder during the last decade, something which should not be forgotten. A strong Dollar correlates well with a weak Oil. Global growth hitting a soft patch would further undermine global demand. The retreat of the US from Syria softens the chance of a confrontation with Iran, and with it the geopolitical risk premium that Oil deserves. The visibly diminished role of OPEC and Saudis in setting Oil prices at the margin is a trend set to continue. This is all the more relevant as energy and commodity stocks have been rather resilient in recent times, despite markets in turmoil, and may adjust in gap at some point soon. Saudi itself is at some risk in such a scenario, including the USD/SAR peg. Before we go, to finish on a cheerful note, we reiterate our basic view, the Critical Transformation Hypothesis. 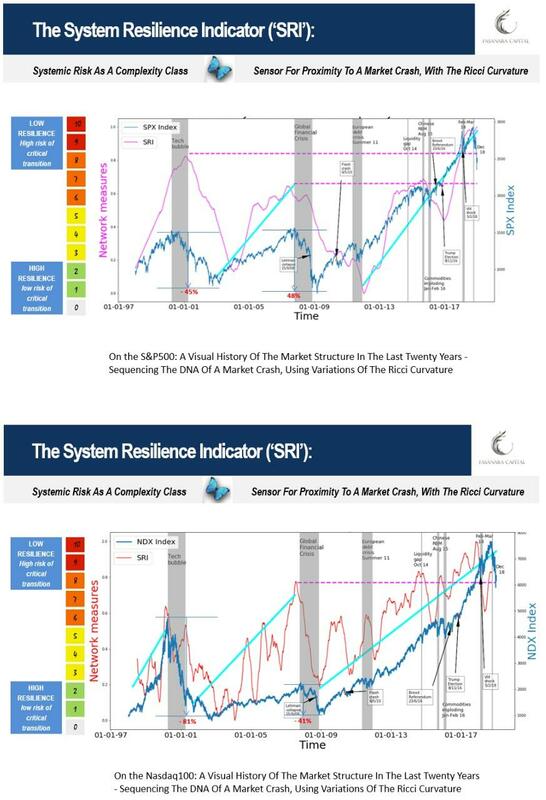 In a big long nutshell, we believe that Systemic Risk in financial markets are best analyzed through the prism of Complexity Science, using the analytical tools available to non-linear socio-ecological systems, where a shift in positive loops comes in anticipation of a dramatic transformation.Chaos Theory and Catastrophe Theory can then help shed light on the current set-up in markets. 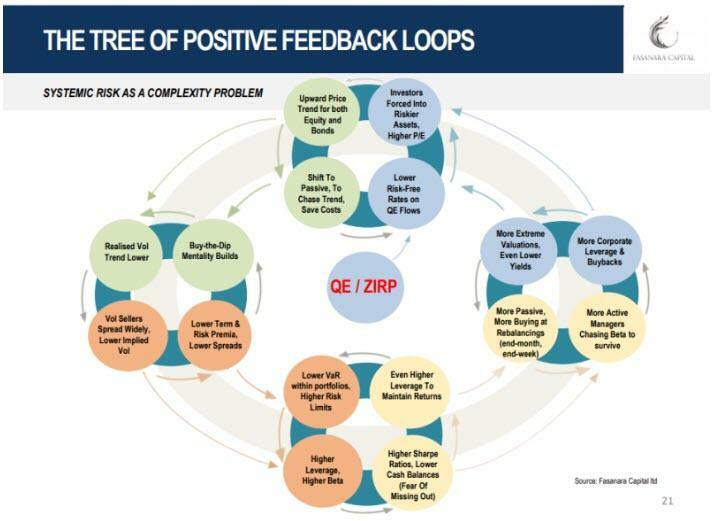 Years of monumental Quantitative Easing / Negative Interest Rates monetary policy affected the behavioural patterns of investors and changed the structure itself of the market, in what accounts as self-amplifying positive feedbacks. The structure of the market moved into a low-diversity trap, where concentration risks of various natures intersect and compound: approx. 90% of daily equity flows in the US is today passive or quasi-passive; approx. 90% of investment strategies is doing the same thing in being either trend-linked or volatility-linked; a massive concentration in managers sees the first 3 asset managers globally controlling a mind-blowing USD 15 trillion (at more than 20 times the entire market cap of several G20 countries); approx. 80% of index performance in 2018 is due to 3 stocks only; a handful of tech stocks – so-called ‘market darlings’ - are disseminated across the vast majority of passive and active investment instruments. The morphing structure of the market, under the unequivocal push of QE/ZIRP new-age ideologism, is the driver of asimultaneous overvaluation for Bonds and Equities (Twin Bubbles). According to the most reputable valuation metrics, these Twin Bubbles are unmatched in modern financial history, so measured against most valuation metrics ever deemed reputable; a condition which further compounds potential systemic damages. The market has lost its key function of price-discovery, its ability to learn and evolve and its inherent buffers and redundancy mechanisms. In a word, the market has lost its ‘resilience’. It is, therefore, prone to the dynamics of criticality, as described by Complexity Science in copious details. This is the under-explored, unintended consequence of extreme experimental monetary policymaking. A far-from-equilibrium status for markets is reached, a so-called unstable equilibrium, where System Resilience weakens and Market Fragility approaches Critical Tipping Points. A small disturbance is then able to provoke a large adjustment, pushing into another basin of attraction altogether, where a whole new equilibrium is found. In market parlance, a market crash is incubating - and has been for a while. While it is impossible to determine the precise threshold for such a critical transition zone within a stochastic world, it is very possible to say that we are already in such phase, where markets got inherently fragile, poised at criticality for small disturbances, and where it is increasingly probable to see severe regime shifts. Fragile markets now sit on the edge of chaos. This is the magic zone, theorized by complexity scientists, where rare events become typical. That said, what is a risk is also an opportunity. The opportunity to position oneself to capture the moment of adjustment draws nearer. It may happen faster and more brutally than most anticipate. The signposts are scattered around us, in plain sight. Our thoughts are expanded upon in this video slideshow.